To display parking options, tap Layers and then Parking in the panel that opens (to turn this mode off, just tap it again). 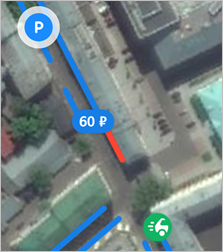 The Parking button is only available in places where the app has information about parking. See also the Layer setting. The icon shows recently vacant parking spots; tap the icon to see comments.